As it gets colder and the nights grow longer, you can count on two things: my dark powers get stronger, and Anne Rice releases a new novel. This year it’s Blood Communion, the latest chapter in the new additions to her Vampire Chronicles that started with Prince Lestat in 2014. I was first at my library to get a copy, and I couldn’t wait to dive in. And despite a busy October (three words: work is insane! ), I’ve been steadily making my way through the book. And this evening, I managed to finish the story. As is my self-imposed duty, I will review it. Even if it does mean staying up later than I meant to. What can I say? I’m a bear for work. At least the kind I do for fun. Blood Communion follows Lestat as his Court is finally beginning to look like an actual royal court. However, at times he finds his own desires and morals standing opposed to what those in his council desire or believe. As the Brat Prince tries to reconcile what he believes with what he must do as Prince of the Vampires, new threats to the Court arise. Old and new enemies resurface, threatening all he loves. And if he wants any of it to survive, Lestat will have to make some very hard decisions. What he decides to do will determine not just what will happen to the Court, but to vampires everywhere. I feel like this novel, more than many of the others in the Chronicles, would make a great arc for a future season of the upcoming Vampire Chronicles TV series. * The story feels oddly suited to an arc for a show based off these books and characters. But as a novel, I liked it. Written with Rice’s usual focus on beauty, sensuality, spirituality, and emotion and with that detail to language that makes her style so unique, it’s not hard to get drawn in. And as the central conflict of the story becomes apparent, you really get caught up in Lestat’s battle not only for his friends and family, but for the very soul of the vampire community. At the same time, seeing Lestat trying to figure out what is the right path for him and his new Kingdom of the Night is compelling. It’s a conflict we haven’t seen this famous vampire have to go through yet (and he’s met the Devil), and I’m glad that Rice decided to explore this new facet of Lestat and the issues that arise from what he’s trying to do. My one criticism is that I wish that some of the new characters introduced could’ve been given bigger roles and perhaps allowed to surprise us more. I know that there was only so much room and there had to be focus on the main conflict, but I felt that these new characters could’ve been a lot more interesting if they’d maybe shown up with different purposes and goals in mind. All in all though, this was a satisfying addition to the Vampire Chronicles and I’m sure that if the show gets far enough, it’ll make for a great season of television. 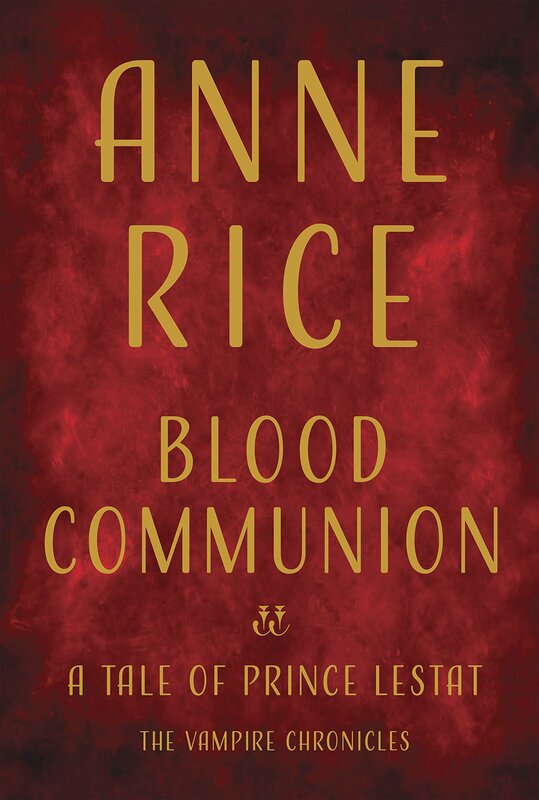 On a scale of 1 to 5, I’m giving Blood Communion by Anne Rice a solid 4. Pick it up, and drink in the majesty of the beginning of a new era of the Children of the Blood. I’m looking forward to seeing the next book in the series has Lestat and the Court doing. Though if the next book Ms. Rice produces involves werewolves, angels, or mummies, I’ll also be excited to read that. What can I say? I’m flexible. *Yeah, in case you missed it, Hulu’s developing a TV series based off Anne Rice’s books and starting with a pilot penned by her son and fellow writer Christopher Rice. As you can imagine, I can’t wait to see it. And is it too much to hope that Tom Mison or Christopher Eccleston can get roles on the show? I love Lestat, he is my favourite character. He’s one of my favorites as well.